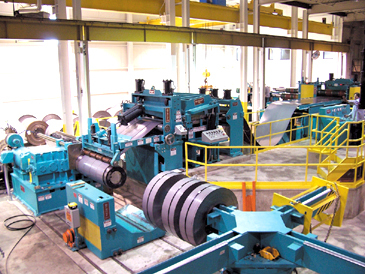 Grand Rapids, MI - H & H Metal Source, a carbon steel distributor of cut sheets and slit coil, has recently installed a 60,000# x 60" wide x 1/4" thick Braner/Loopco slitting line to process cold rolled, coated, and hot rolled P & O products. The new Turret Head™ slitting line is designed to slit both mild and high carbon steel up to 70,000 psi shear strength. The line complements a plant expansion project and newly constructed offices. 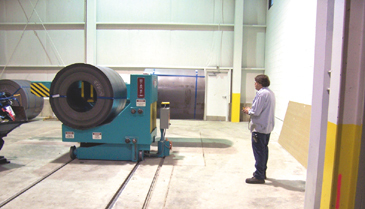 Coil Loading and Unloading: The entry and exit coil cars are operated by hand-held, remote radio controls. The remote controlled cars are easier to operate than traditional pendant ones because the operator is not tethered to the equipment by a cord. 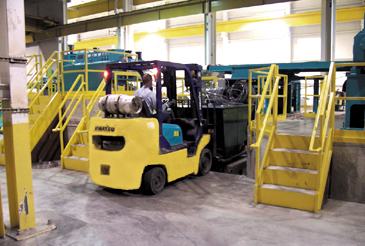 They allow free access around the equipment and provide clear sight lines, while loading and unloading coils. Two (2) Head Turret Slitter: A quick change two (2) head turret slitter allows for tooling changes to be made off line while a master coil is being processed. The robust 9 inch arbor head is powered by a 200 horsepower gear train that can process 8 cuts in 1/4" thick material at 50,000 psi shear strength, 6 cuts in 1/4" thick material at 70,000 psi shear strength, and up to 30 cuts in light gauge product. The precision machine is tooled with a shimless tooling package that can hold slit width tolerances of plus or minus .002". 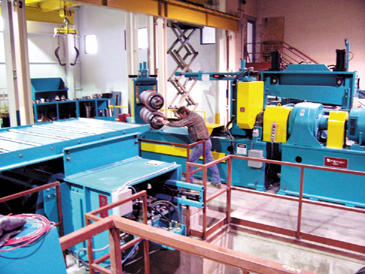 Crane Free Scrap Handling: Edge trim is wound on two (2) individual scrapwinders powered by two-speed hydraulic motors. Levelwinds with programmable timers allow for compact, tightly wound bundles. Finished bundles are dumped out the bottom into an accumulation trench, and pushed offline by a hydraulic ram into a hopper located on the side of the line. The hopper is staged on a hydraulic lift that elevates to floor level so it can be removed and unloaded with a forklift.